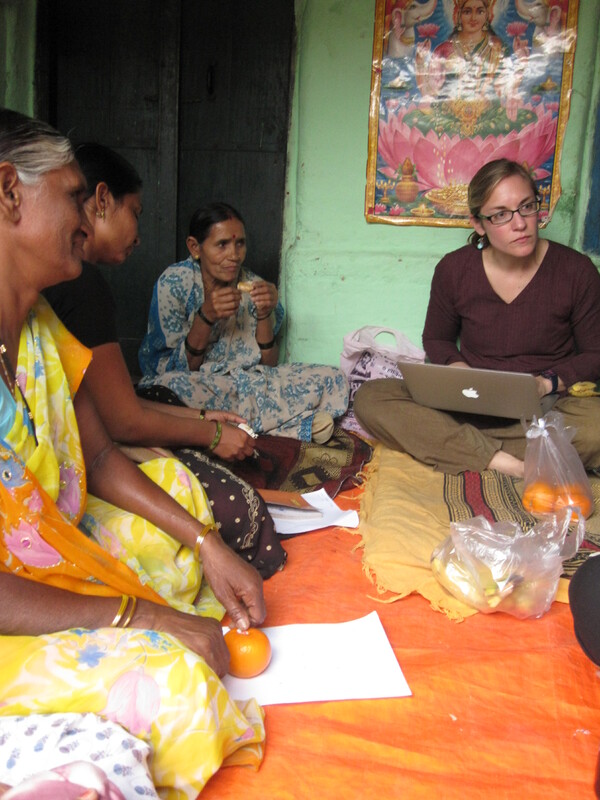 Some of our most meaningful exchanges have been with members of a Women’s Collaborative. The Bajaj Foundation encourages women’s empowerment through organizing and facilitating self-help groups. These groups help women come together to pool their resources and ideas in order to generate alternative means of income. They also serve as a vital support system for the women. Here are some reflections on our experiences with these remarkable women. Kalpana values the importance of satisfying her social and financial responsibilities in business. She has two business plans to address both of these responsibilities. First, she offers water for free to anyone. However most of the time when a mom would come for the water, her son would ask for pepsi that’s next to the free water and the mother would end up buying the pepsi. This increased her profit tremendously. Similarly, many times people go to her to help with paperwork and applications, she offers help free of charge and then she charges them to make copies on her photocopier. Almost all of the women in our interview group said that before they became involved in the women’s collective, their husbands and families wouldn’t allow them to leave the house by themselves, let alone join a group for women. Many of them joined the group secretly and then, once the benefits of the collective became obvious, revealed their membership to their families. In the interviews, they spoke about how becoming involved in the collective has increased their confidence, social skills, and standing in the community. It’s hard for me to even fathom the enormity of what that means, especially having grown up in a family that has both allowed and encouraged me to be independent. I can’t help but think that these interviews had just as big (if not bigger) of an effect on me as an interviewer as they did on the women I was talking to. My mind was expanded in ways that I didn’t expect at all going into the experience, and the women in the collective were given a chance both to tell their stories in an open/receptive setting and to practice their English. The second meeting with the village women who are part of the Bajaj Foundation Women Empowering Program was way too inspirational and interesting to me. Throughout this meeting, I was able to listen to these women telling their stories openly and expressing their eagerness to learn and to improve their personal skills. Most of them joined the program because it offered trainings and gave them the chance to visit Ahmadabad in Gujarat where they were exposed to different workshop sessions about how to speak confidently. According to them, the main help that was received from the Foundation was in business skills. They were taught that business has two sides: financial and social responsibility. Previously, if they had to buy something, they had to travel to another village and so they would lose that money and the day’s wage. Thus, it is better to have business with the community. They are in the process of starting a business of buying local produce and setting up a processing plant and preparing the food to be sold in the market. In addition to sharing with us their history with the Bajaj foundation, they also told us about their future dreams for themselves and for their children. Most of these women view that education is essential to their wellbeing and to the improvement of their financial situation. They also hope to get more training and learn more about how to use computers and learn English language. 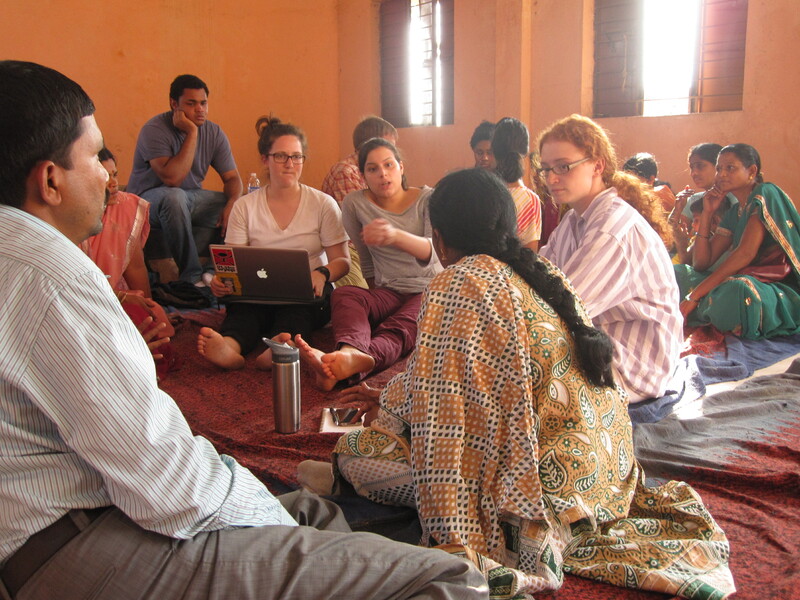 Molly Berntsen and others teach each other Marathi and English collaboratively. Almost all of the women that we interviewed were married with at least one child. Some pursued love marriages, while many had their marriages arranged for them. The most striking point in our discussion seemed to be that whether women’s husband was chosen by her heart or by her family, the challenges that she would face in married life were likely to be very similar. For most of the women, their relationship with the Collaborative blossomed slowly over time. For nearly all of them it was a struggle. Many found their husbands were less than enthusiastic about their participation and some were even forced to resort to sneaking out to go to meetings. One of the most beautiful things about the women was the candidness with which they spoke. They were not afraid to recount what life had been like before joining the Collaborative. All of them seemed to echo the same themes. Marriage had brought some frustration, and them all a sense loneliness. In joining the collaborative, women became the arbiters of their own destinies if only for a few hours. They controlled their own money, in their own space, in a relationship that they had chosen to be a part of and could leave anytime. There was definitely a sense that this simple notion of each woman’s right to determine what she did with a small piece of her time and money had opened a gateway to a much bigger store of autonomy and self-confidence. The benefits of the Collective radiate out beyond the walls of the gathering space as women become fuller participants in their households and communities. Being able to take out loans, or start their own businesses has given women a voice at home. More importantly, it breaks the patterns of isolation experienced by the women that we interviewed. They begin to feel that they have the right to interact with their communities and to have their opinions represented in the presence of their husbands and in-laws. Most hopeful were their descriptions of how they would work to create a better future for the girls to follow them. Education was paramount and the women all wanted their children to at least complete high school. I did not feel that the women were shooting farther than their beliefs allowed them too or placating our audience. Their hope was tempered by the realism that these women must employ to get through life. They dreamed of their children becoming engineers, and they dreamed that dream because many of them expected to fall short of it. But in falling short, they knew that their children would complete high school. The most hopeful thing about the women’s collaborative was exactly that-a spirit that didn’t expect miracles, but planned for them anyway. Emily records stories of the womens’ lives, and their dreams for the future. It started raining soon after we got in the car. We’d spent most of the day going over English vocabulary that the women already knew: “The apple is round,” “The egg is white,” “The orange is orange.” We spent the rest of the time butchering the Hindi and Marathi translations of these phrases. “I have one sister,” “I have no brothers.” Language simultaneously served as a point of interaction and as a barrier as we bided our time speaking these small phrases while we waited for a translator. After our interview began, the wind picked up and the clouds moved in. The women talked about how their membership in the collaborative helped them to buy school uniforms for their children or medical care for their families. The group gave them a certain level of financial autonomy and even the ability to leave their house when they wanted to, a few freedoms that they had not previously experienced. Our interview began late, and some women were unable to stay because of other work they had to do. We would not get to hear what they had to share, but they’d spent their entire afternoon with us, sharing information about their families, encouraging our fumbling Hindi and Marathi pronunciations, and giving a generous gift of their time. After we’d finally wrapped things up, the sky had darkened to a severe gray. Now rain pattered the exterior of the car, and we waved goodbye. It seemed as though the whole town came to see us off, despite the turn in the weather. People beamed as their hair began to stick to their necks and their clothes draped heavily over their limbs, beginning to swing slowly with water. The cows parted to give a final, confused goodbye as our cars bounced over the uneven road. Village Volunteers like Padma Munjewar, 38, hold monthly meetings with beneficiaries to manage bookkeeping and projects. They also act as a KJBF liaison for the beneficiaries. Each group has between twenty to thirty members. Padma joined a WC group because the few NGOs that previously worked within her community gave out money but did not provide any training. The purpose of WC groups is to build a seed fund that is sustained by its monthly contributions from its members. WC groups then grant microloans to help start small businesses within their community. Women have been able to start a variety of shops, from print stores to daal processing plants. When local businesses are established, women do not have to travel long distances to urban areas for goods and services. Members of WC groups gain much more than financial assistance. The program provides valuable computer, accounting, and business training, and they get to travel to large cities for workshops. Members can meet other women and practice public speaking, which helps them gain confidence and expand their social network. The women are given tools to advocate for themselves and their children. Sindu Marudkar, 43, wanted her two sons to receive an education, and was more concerned that they become responsible citizens – the jobs would follow good consciences. Padma also hoped for her two daughters to get good jobs after graduation, as she had completed her bachelors degree but had been unable to work due to family circumstances. The women of WC groups were busy establishing a strong foundation for their kids to complete higher education, as well as improving their own lives. Yet there seemed to be a pattern of escape, of children leaving the village to pursue other opportunities. As programs like the WC groups continue to develop, these sons and daughters will hopefully bring those urban prospects back to their home communities. One of our most riveting experiences thus far has been our visit with the Women’s Collaborative. During one of our interviews a woman told us, “Before joining the group my life was very sad. Now joining this group I am very happy and I want to live. For a while I have struggle with life. My in-laws are very torturous. Now joining this group I am free.” I felt my throat close and the tears form in my eyes as Shital told me her story in Marati. The sorrow in her brown eyes was evident. Her pain tugged at my heart. I had to take a couple of breaths to compose myself before I could continue with the interview. 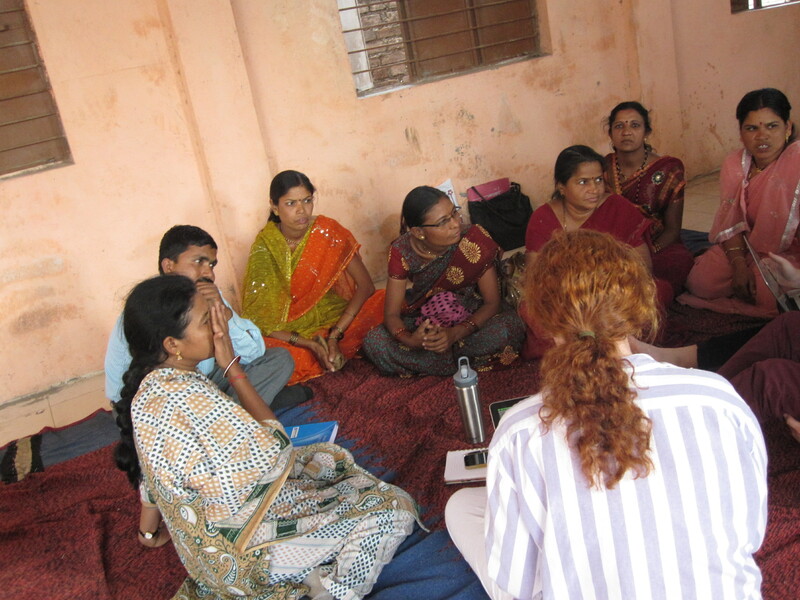 We were in the village of Vijayagopal talking to the Women’s Collaborative the Bajaj Foundation had helped establish. The collaborative is a self-help group where the women contribute a certain amount of money to the group every month. Members can take out interest-free loans for things they cannot afford such as their children’s school uniforms. They also pool their money for group income-generating activities such as sericulture. However, this group does not only help support them financially. The women found they can also rely on each other for moral support. They have also gained more confidence, self-worth and independence. These women have faced a lot of challenges. As the translator said, “Their husbands will not permit them to go outside. Some men will take money. Some banks will take back their money. Husband will question why they’re going to meetings. They believe they should work at home only.” Despite the challenges, they speak of hope for their children and for themselves. Primarily they want to not only provide higher education to their children but also make their daughters independent. Each woman had a moving story and by the end of the day of interviews we were all keen to come back to the community to further develop the relationships we had formed that day. Incredible work! Women are fierce all over the globe!